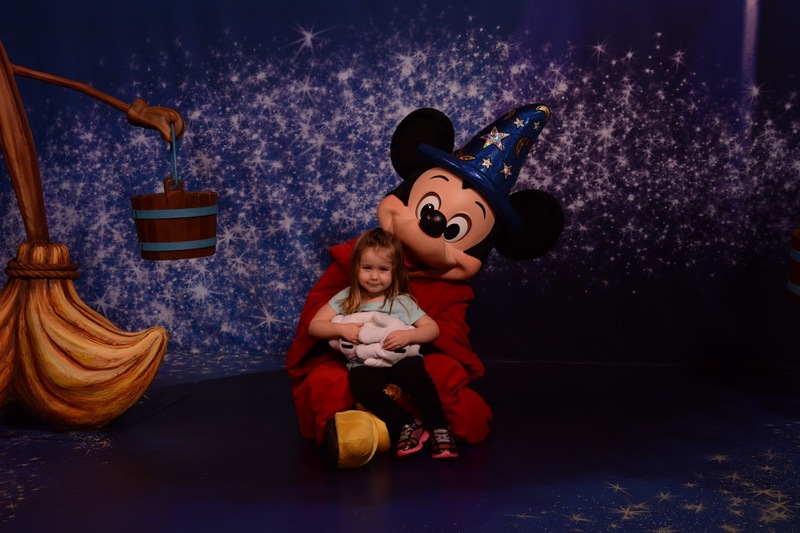 Our visit to Hollywood Studios started with fast passes to Voyage of The Little Mermaid followed by us braving the downpour and running across the plaza to Disney Junior Live on Stage. All the Disney Junior stuff was also right by the Star Wars stuff so we got to see the storm troopers on patrol. We had talked about going in and actually meeting the Star Wars characters, but both kids were napping later in the day when we were going to go, so it didn't happen. Oops! Afterwards we headed over to our second fast pass, Toy Story Midway Mania. 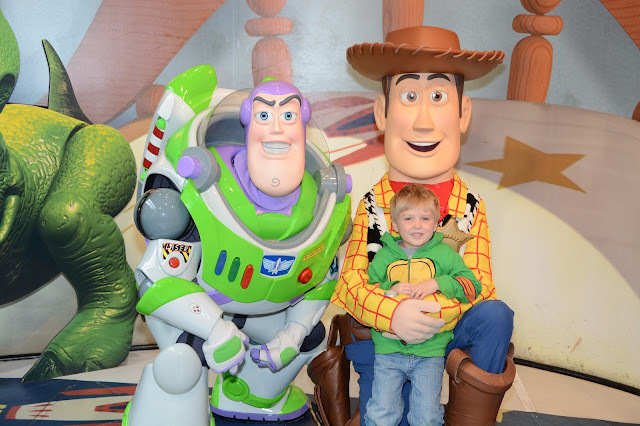 Before we went to our last fast pass of the day, For the First Time in Forever, A Frozen Sing Along Celebration, we decided to let Ewan see Buzz and Woody and Cecily see Sorcerer Mickey since they were right there. 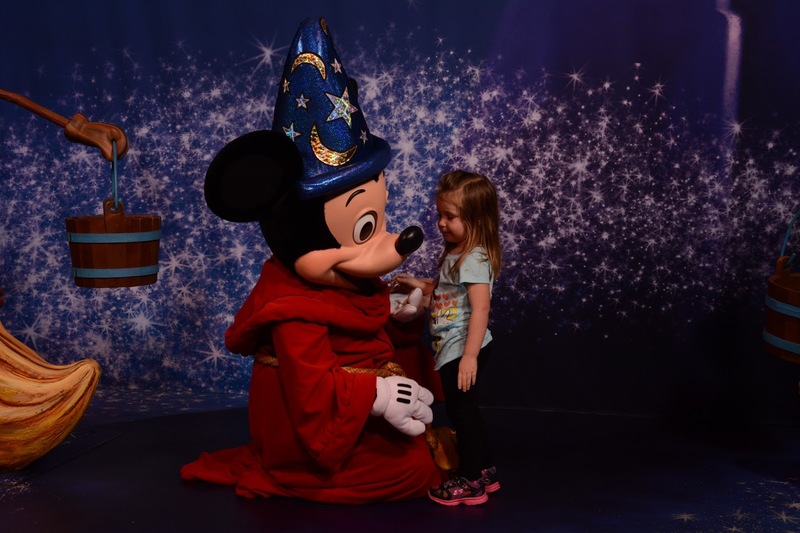 This was when it was still raining heavily and there wasn't a line to see Sorcerer Mickey, so Cecily and I got in right away and even spent a lot of time with him. She LOVES Mickey and it was so cute to see her with him. Unfortunately the line to see Buzz and Woody was a lot longer than we thought and we missed our last fast pass. Ooops! But, we were able to get fast passes to see Fantasmic at the end of the day. 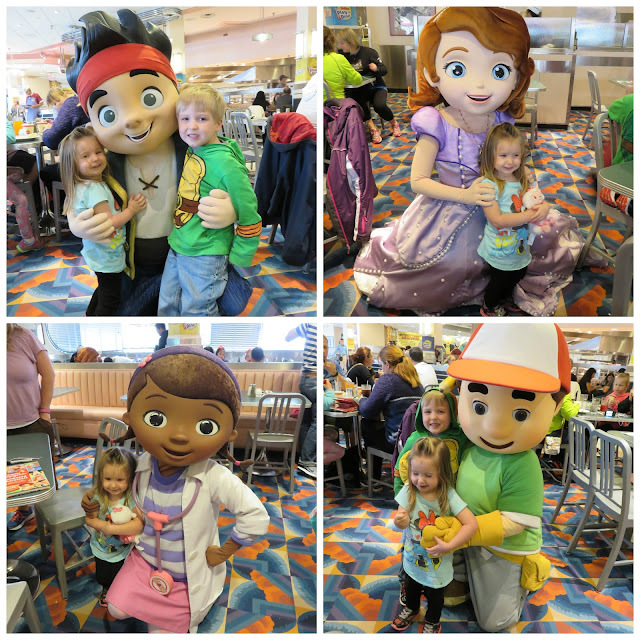 We had lunch at Hollywood and Vine where the kids got to meet the Disney Junior characters. They loved it, although Ewan wanted nothing to do with Doc McStuffins for some reason. The food here was the best of all the character dining we did, even though I ate mostly from the kid section because I didn't like a lot of the sauces things were in. Alan, however, loved it. After lunch, we didn't do much except wander around and look in the shops while the kids napped and let the kids run out some energy at the Honey! I Shrunk the Kids playground to kill time until Fantasmic. I would have liked to have done a lot of the Star Wars stuff, the Movie Ride and seen the Indiana Jones Stunt Spectacular but since they were napping, we didn't want to mess with it. By this point in our week they were worn out and we were letting them sleep. We actually had our most peaceful dinner at Pizza Planet because they were both still sleeping! Our fast passes for Fantasmic said that we could get in at 6:30 but we were tired of waiting around so we decided to see if we could get in sooner. It's a good thing we did! We got there around 6:15 and the entire center portion of the seating area was already full. Luckily, we still got good seats, if by the crazy loud speakers. I really liked Fantasmic and so did Alan and Cecily. Ewan, on the other hand, was terrified. Silly kid! I know a lot of people say that Hollywood Studios is a half day park, and I tend to agree with them. Unless you do all of the rides and shows, there isn't all that much to do, especially when you have kids that can't ride many rides. I also like the fact that it's not that crowded. This will probably change though once all the Star Wars and Toy Story stuff is added. Even though we were kind of bored in the afternoon, it still tops Epcot in my book. I didn't get sick here!